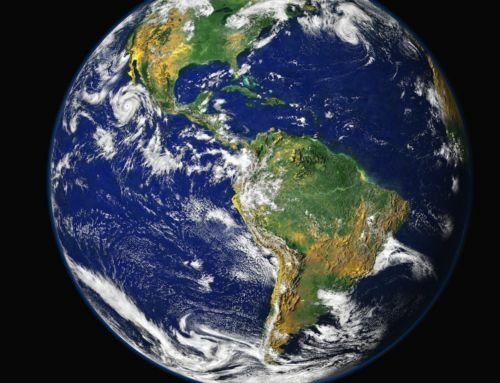 • Jaw-droppingly beautiful, a photographers dream! Situated in the heart of the Carse of Gowrie on the western edge of the pretty village of Errol, the only clue that such a magnificent house sits in the nearby vicinity is the sight of a stone gatehouse set back into the trees behind a pair of iron gates. Like secret treasure, Errol Park is tucked away behind an ancient stone wall, completely hidden to the naked eye. 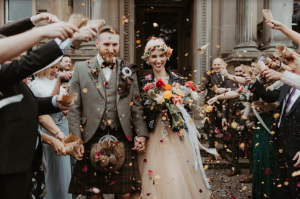 It’s when couples pass through the gates and arrive at the pillared entrance of this sensational stately home that the magic of Errol Park begins to unfurl. 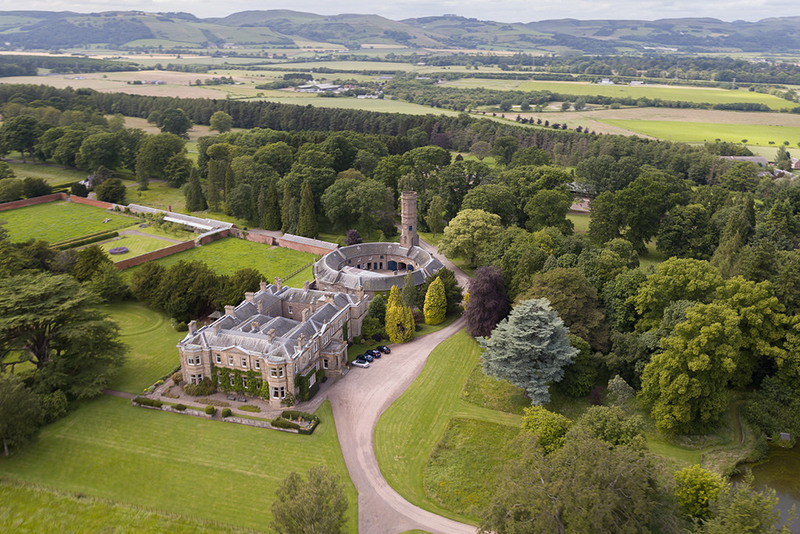 Originally built in 1747, Errol Park was tragically destroyed by fire in 1874, but thankfully the residence rose from the ashes and in 1877 the glorious Renaissance style building that we recognise today was built on the footprint of its predecessor. Upon entering Errol Park, it’s instantly evident that the property has and continues to be a very much loved family home (albeit, a pretty substantial one!) 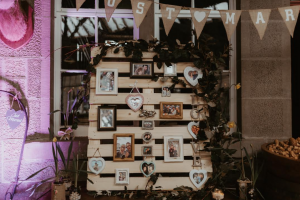 where the fabrics, furnishings and personal touches combine to create an informal, stylish and relaxed atmosphere with oodles of rustic charm. 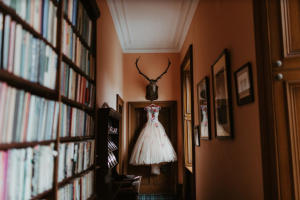 With gloriously proportioned south facing rooms, an incredible grand hall, breath-taking views over the River Tay and picture-perfect parkland and garden grounds, it was only a matter of time before the owners of Errol Park realised its potential as a wedding venue and so in 2014, the estate hosted its first wedding. Errol Park is bookable on an exclusive use basis for between one and three nights where up to twenty guests can be accommodated in a number of stylish bedrooms. 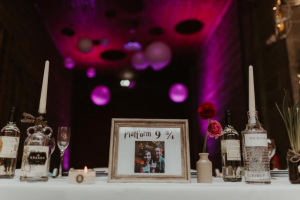 Couples are encouraged to go all out and make the venue their own for the duration of their stay and that’s exactly why Team Fuze love this venue so much. 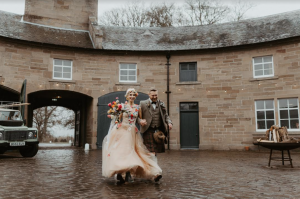 In recent years, imaginative and creative couples have shunned country house venues opting to hire barns and industrial spaces where they can embrace the luxury of a blank canvas and go wild with their own ideas; however, when Janis Marshall Reilly married Nikki and Nick at Errol Park back in April, we were obsessed with how much creative freedom the couple were given to put their own stamp on the property, illustrating how it’s possible to create a bespoke and contemporary wedding within a traditional country house. As you can see, the fruit of Nikki and Nick’s labour was absolutely fabulous! 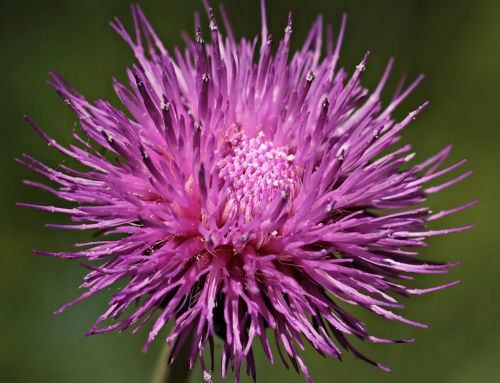 The versatility of Errol Park doesn’t just end with the interior décor. 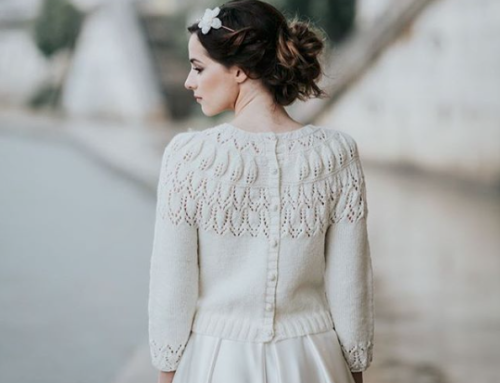 Come rain or shine there’s also a plethora of options to hold the all-important wedding ceremony. 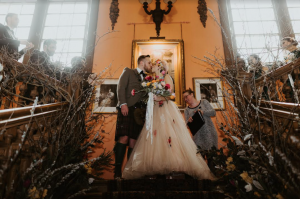 Warmed by one of the property’s roaring fires, throughout the winter months couples can take their vows in the grand entrance hall or in one of the beautiful reception rooms looking out over the River Tay. Throughout the summer months couples can say an alfresco “I do” wherever their hearts desire. The enchanting grounds ooze so much romance that Errol Park could have been written into the pages of a Jane Austen novel! 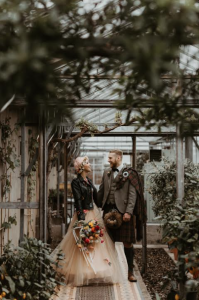 Victorian glasshouses, walled gardens, ancient oak trees, sprawling parkland, rose gardens and even an 18th century yew maze complete with an adjoining moated folly make for a ridiculously romantic backdrop, so however the weather fairs, couples and their photographers will not be disappointed. 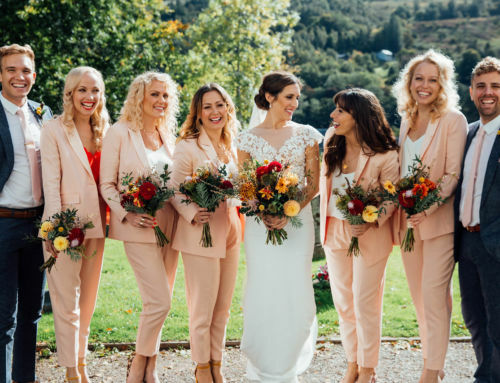 When it comes to wedding breakfasts and evening receptions at Errol Park, once again, couples will be spoilt for choice. 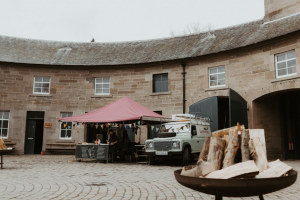 Commercial kitchens are available for appointed caterers to come in and do their thing and any vehicle from mobile fish and chip vans to champagne bars can drive right into the courtyard to the delight of hungry guests at the midnight hour. 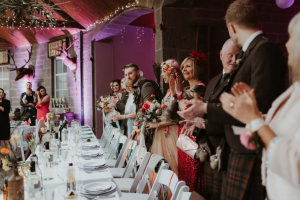 The majority of couples opt to make the most of the spectacular circular stable yard, where a large, glass fronted stable building opens out onto the cobbled courtyard where firepits roar and an impressive gothic clocktower watches over the evening action. 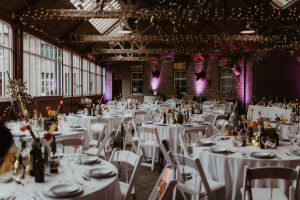 The stable building comfortably seats 180 guests and makes for an extremely atmospheric space where fairy-lit oak beams hold up suspended floral garlands and stags heads hang from exposed brick walls. 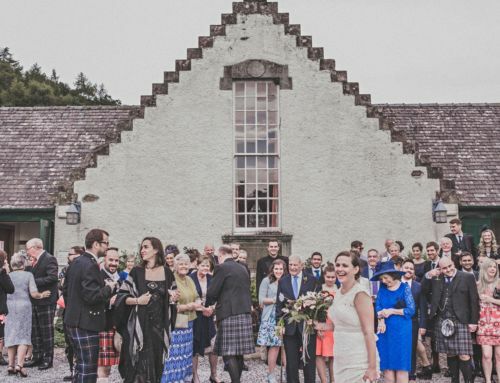 A cosy, crescent shaped room on the first floor of the stable yard is available for smaller, more intimate weddings. 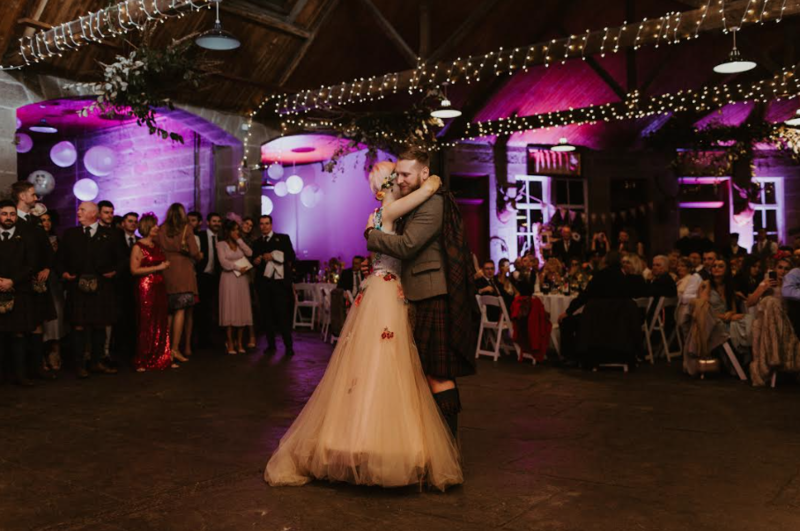 After the speeches are over, the evening can really get going and the stable yard truly comes into its own where atmospheric lighting, a huge dance floor and plenty of room for bands/djs is there for newlyweds and their guests to dance the night away!